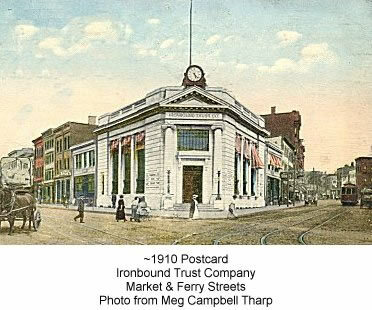 The Ironbound Trust Company was incorporated February, 1907, and opened for business June 3rd. of the same year. At the start the company occupied modest quarters at 11 Ferry Street and continued to do business there for three years. The present building, at the junction of Market and Ferry Streets, was completed and occupied in July, 1910, and is fully equipped in every way to handle the growing business of the company. The safe deposit vaults in the basement are burglar proof and fire proof and were built with every modern device for safety and protection. The door of the vault, which is circular in size, is a splendid piece of mechanism and weighs fourteen tons, being the first round vault door in Newark. While the company is prepared and equipped to perform al the functions of a trust company, it has largely confined its work to the regular banking business, including every conceivable branch of banking, also conducting a safe deposit department for the convenience of its patrons.